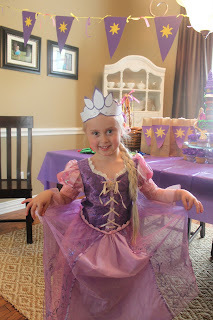 My sweet princess celebrated her 5th birthday in style with a "Tangled" Rapunzel party. 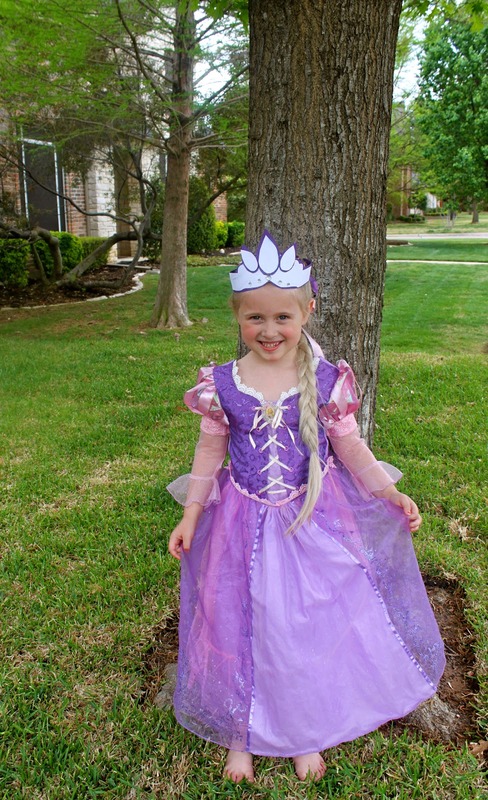 She is all about Disney princess movies, Rapunzel, and popcorn. 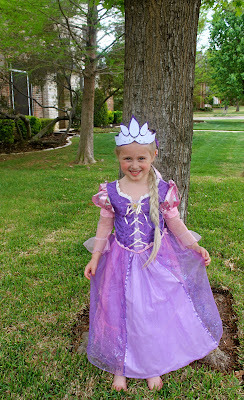 So with the release of the dvd on Tuesday, the timing was just right for her to have a movie party at home. Each guest was mailed a movie ticket, complete with perforated bar code at the bottom. 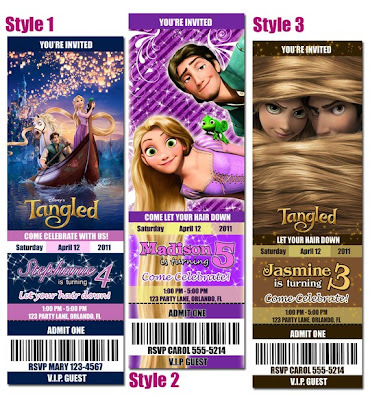 I ordered the tickets (similar to the ones shown below) through a designer on etsy. She customized the information and I printed them at home. Then I used a tracing wheel, from my sewing kit, to make the little 'holes' at the bottom. 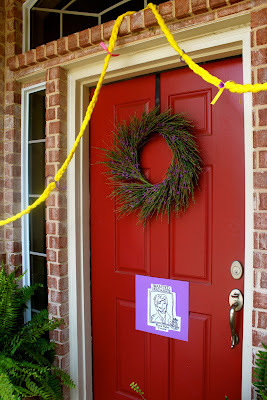 Hair Braid, Flowers on Cupcakes, and Ribbons on Bunting via SuperMomMoments. 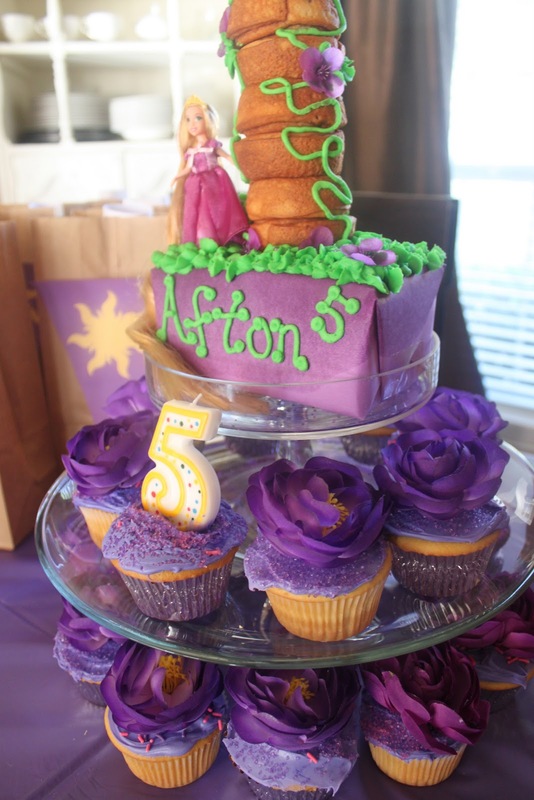 Afton was very specific about wanting a 'little doll' on the cake. So I used Bakerella's tower cake for inspiration and then 'made it my own' with more icing and flowers. My tutorial for the cake can be found here. I made bunting with the 'official' sun medallion from the movie. My tutorial for making bunting can be found here. To make it "Rapunzel" bunting- just use purple card stock and use this stencil to make the medallions from yellow card stock. They were a bit tedious to cut out, but I only did 9. 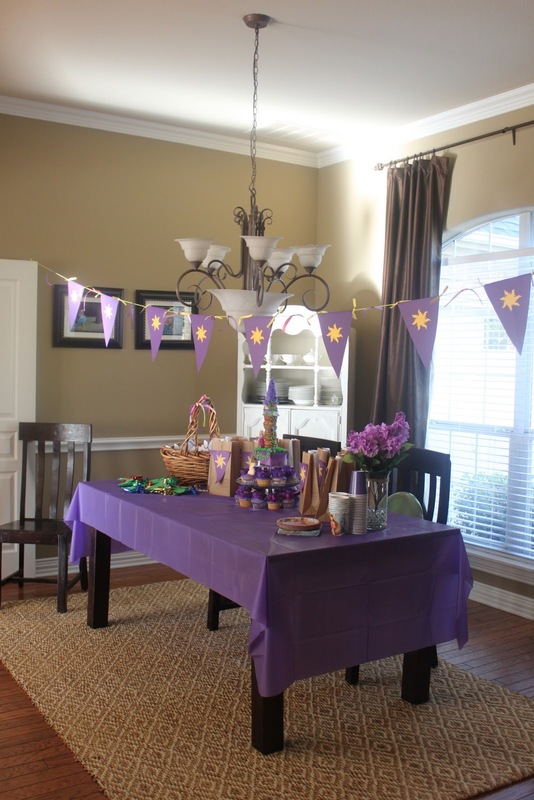 The table was decorated with goody bags, Rapunzel crowns and Pascal party blowers. A simpler and printable version of the medallion bunting can be found here. The goody bags held 'stick-on' earrings, rings, and Rapunzel coloring sheets. We set up our garage like a movie theater, but "Rapunzel-style" complete with purple chairs and lanterns. The lanterns were purchased from Party City. The girls snacked on popcorn and drank juices boxes while watching the movie. The chalk board wall was set-up so the girls could 'decorate the walls' like Rapunzel does in the movie. It was a great party, fit for a Princess. And what would a birthday party post be without... a few linky parties?! What a cute cute birthday! I love the Cake, and the fun decorations! It looked like your little girl had a great party! Thanks for stopping by today and your sweet comment. What a darling Birthday party! My daughter would be so jealous if she saw this!! I saw your link at tatertots and jello. I'm very impressed with that cake! 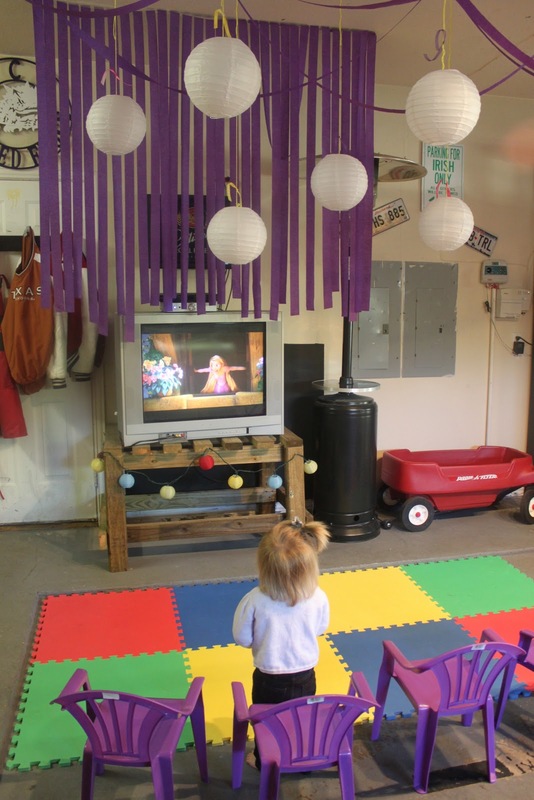 The party looked like a big hit! Your party looks great! Would you mind telling me where you found the white lanterns? I am having trouble finding solid white ones. Thanks! Thanks for all your sweet comments! The white lanterns are from Party City. If you don't have a location near by, you might check their website. I have also seen them at Cost Plus World Market. Wow, what an awesome party! I am very very impressed. who is the etsy's vendor that you used to create the invitations? I would like to borrow your idea for my daughter's birthday. Thanks so much! Thanks! I got the invites at http://www.etsy.com/shop/ondemandmemories. 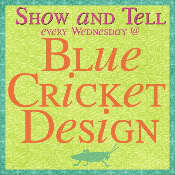 You might try emailing the girl at http://www.etsy.com/shop/ondemandmemories and seeing if she can make some for you. I got them for $9.99! Good luck with the party, let me know how it goes! Great idea's.... 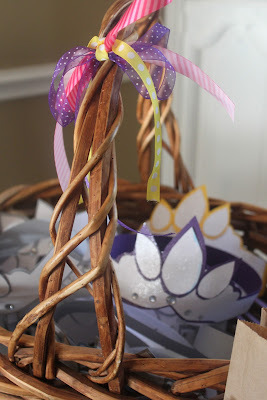 I want to make the bunting for My daughter's b-day party but when I click on the link to make the bunting it brings me to another site and it has only the instructions to make the circle banner... How did you make the bunting with sun on it? 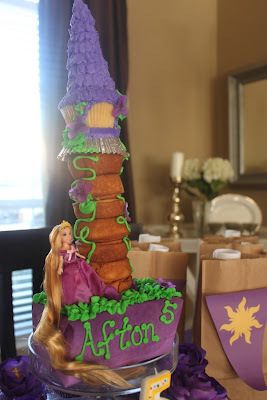 My Mia turns 5 in June, and between Disney Rewards site, and now your awesome ideas (found your link on their site) I have some great idea's for her 'Tangled' Birthday party!! Thank you!! This blog post made me want to start blogging, you are so creative! Thanks for inspiring me! 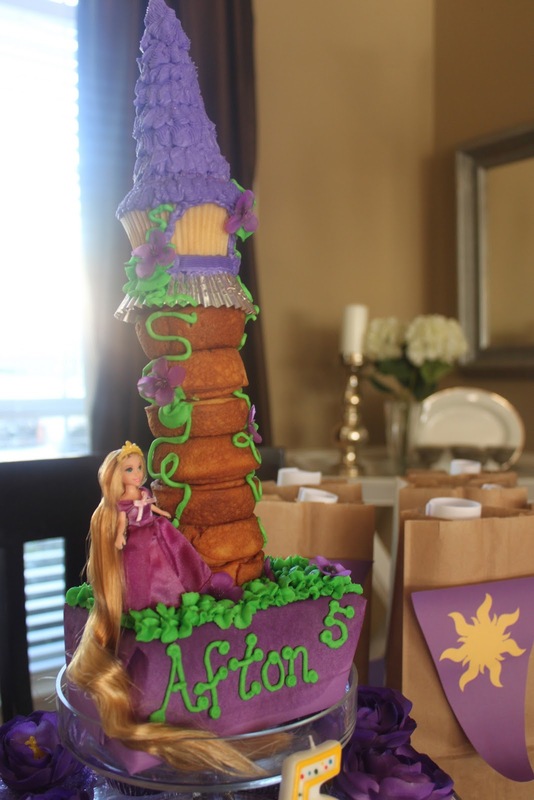 A good friend of mine just had a 'Tangled' themed birthday party too! She had the great idea of serving the snacks in frying pans! I thought that was a great touch :). She also constructed a tower made out of cardboard boxes that the kids could climb in and decorate. this made me really excited about my own girls' party in august. i'll be out on a trip the week before her birthday so i'm starting early! thanks for the ideas :) lovely! Such cute stuff! I also have an Afton who will be 5 this month with a Tangled party coming up! Gift card is a best gift on birthday occasion.